We set up another slice for our “Live” site in addition to our “Production” slice. We’re going to be hosting the application on Slicehost initially, and might move to Amazon EC2 eventually. Bought our Wildcard SSL Certificate. Every account on Minuteglass, even our free plan customers will be able to use SSL. Filled out most of the paperwork for our payment gateway. We’re signing up with Braintree Payment Solutions. We have heard nothing but good things from developers and friends. Lastly, and probably most important. There’s a bottle of champagne in the fridge waiting for launch. Thanks to our tremendous design and development team for their great work. If you haven’t signed up for our beta, there’s still time. More news as it happens on Twitter. Just a quick post to update all of our readers. Development has been continuing at a steady clip, and we have most of the core functionality built. We’re working on some extra features, a few things we decided to change at the last moment, and also working on our promotional site. Stay tuned for the beta this summer. In the past month we’ve made significant progress on development and have some great new developers working with our team on the project (I’ll make that introduction in a later post). We’re gearing up for our public beta (still a few months from now) and if you’re not signed up already, go to our homepage and sign up! We received our first batch of stickers (1,000) from Stickerobot and made some shirts. Check out how cool they look. If you’d like a sticker just let us know. And check out the great looking shirt. We don’t have any more shirts at this time, but will order some more after we launch our product. Tom Chapin (partner at Tornado Design and co-founder of Minuteglass) will be in Austin, TX this week for SXSW Interactive. 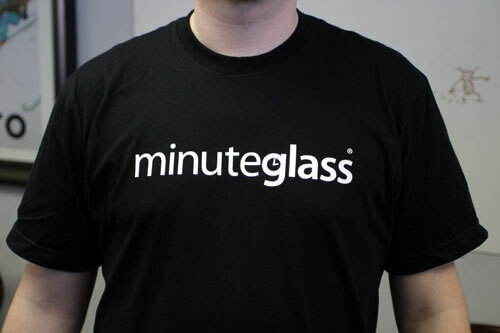 If you see him, say hello and ask him about Minuteglass. 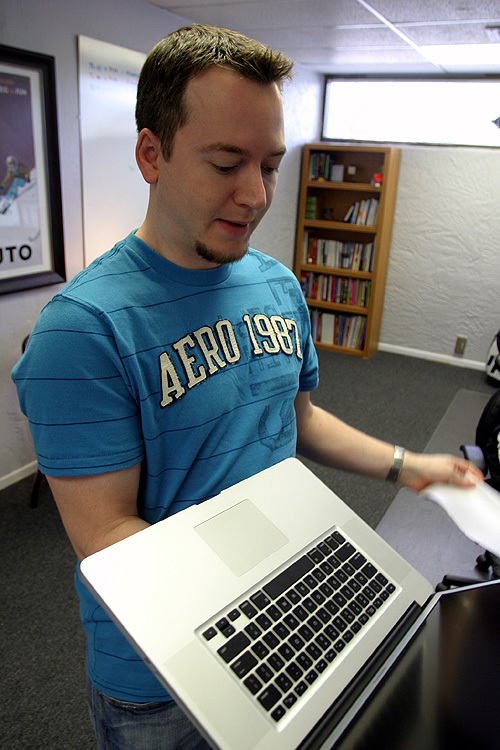 Tom Chapin, our lead developer (and Minuteglass co-founder) just upgraded to the newest MacBook Pro! It’s his first Mac and so we’re all rooting for him as he switches away from Windows (at least for Ruby on Rails development work). It’s the new 17″ matte screen. So far so good! In case you aren’t aware, we’re building a time tracking tool and actively developing it right now. It’s called Minuteglass and you can sign up for beta at Minuteglass.com. Alongside of main application, we are now working on a desktop widget for Minuteglass! It is being developed in Adobe AIR and we’re pretty excited about the prospects. We designed everything in Photoshop first to get a feel for how it would work. We’re realizing quickly that the widget will be a major part of our application’s success. Because it’s in Adobe AIR, we will be able to roll it out on all the major platforms and at the same time. Screenshot: Widget sign in page. As we get closer to launching Minuteglass we’ll show you the rest of the widget. It has two major features: a stopwatch mode and a manual time entry mode. But you’ll always be able to use the web based tools as well. For about 6 months now we’ve been in a bit of a “feature lockdown” meaning no new feature is added if we think it will take an extra day of work. This allows us to concentrate on launching our product, and keeping our code debt to a minimum. In the world of web startups they say “launch early” for a reason. The longer you work on your application the more details and ideas you have. Before you know it your simple idea has turned into the next bloated version of Windows. We’ve recently picked up a lot of development momentum (5 people now working on it). We don’t have a launch date yet, but we’re really excited about our progress. So last Friday we launched our new coming soon page — check it out at Minuteglass.com. The goal of the new signup page is to attract interest and get people to sign up for our beta invite list. Five days later we’re sitting at about 60 new subscriptions and they’re still coming in! That’s a significant increase since the site had almost zero traffic beforehand. Anyways, thanks to One Page Love, Dailyhoopla, and CSS Based for featuring us! A lot of people probably are unaware that we maintain a list of time tracking applications. We realize that everybody tracks time for different reasons and a time tracking tool that works for one person might not be perfect for another. That’s why we encourage you to check out TimeTrackingResources.com where we currently have links to over 50 time tracking apps — from software to web. We’ll be maintaining this list and adding new apps whenever we spot a new one. Thanks! When selecting a time tracking tool it is important to choose something that offers you both flexibility and is easy to use. If you’ve ever used Basecamp, Freshbooks, or Harvest to track your time you’ll be familiar with the fixed “Client > Project > Tasks” structure which you must follow. Time must fit into that a project and projects must be associated with a client. But what if you want to track your non-billable time or don’t need a whole “project” just to track a few hours here and there? That’s where these tools break down. If you want to track time for trivial tasks like “Email” or “Writing Proposals” you’re out of luck. Most time tracking tools make it difficult to calculate your billable efficiency — the percentage of your time that is billable compared to non-billable. If you track all of your time this is possible. This is one of the ways that Minuteglass is different. Instead of “Client > Project > Tasks” our model is centered around categories that you create. Meaning you are free to create your own structure for tracking time. This gives you the flexibility to both track billable time and your own non-billable hours.